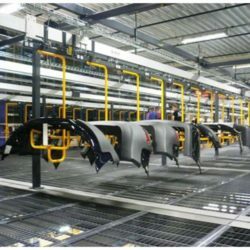 Storage Retrieval Distribution Conveyor Line - IntelliTrak Inc.
One of the biggest challenges that industries face is the shortage of space required for efficient storage and retrieval. The IntelliTrak 150 Series Overhead Conveyor is ideal for lower weight, higher speed applications, and excellent for accumulation, staging and product transfer. The modularity of IntelliTrak’s friction drive system (no chains) and support structure (bolted, not welded) allows for a custom over/under conveyor design, taking full advantage of previously unused overhead space. Unused overhead space + IntelliTrak 150 Series = the ideal solution for accumulation, staging and product transfer. 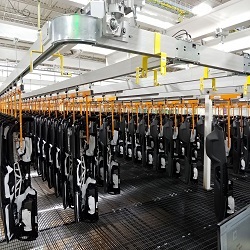 Streamlining production reduced delivery time by 75%. 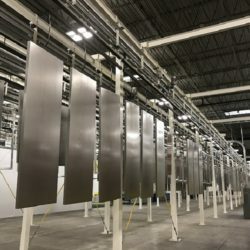 Custom overhead conveyor makes finishing, storage and retrieval of 7 ft. metal sheet panels easy. 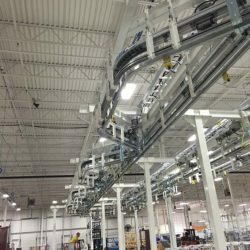 IntelliTrak was able to optimally use previously unused overhead space by moving assembled parts up to the mezzanine for storage. With a custom-designed product carrier, the conveyor is extremely flexible, making it able to handle several different versions of product. Long delivery times and inaccuracies were all too common for this manufacturer of blinds. With an outdated system that required elevation for buffer between processes, outfeeds that used gravity to pull the carriers away from the main line, and no automated production sequencing or MES solution, an upgrade to the IntelliTrak 500 Series was the ideal solution. IntelliTrak designed, manufactured and installed a custom IntelliTrak 500 Series Overhead Conveyor. 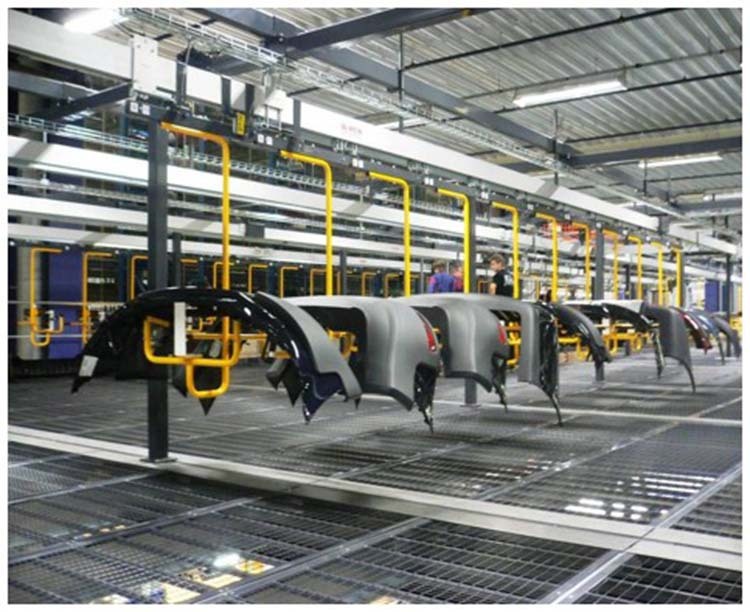 Not only did they save valuable floor space by going vertical, production equipment was organized for more efficient manufacturing flow and an MES solution was implemented to track production. Running three manufacturing shifts and only two paints shift, meant the client, a leading supplier of commercial refrigeration, required a large amount of WIP storage space and an easy retrieval process integrated into their overhead conveyor system. 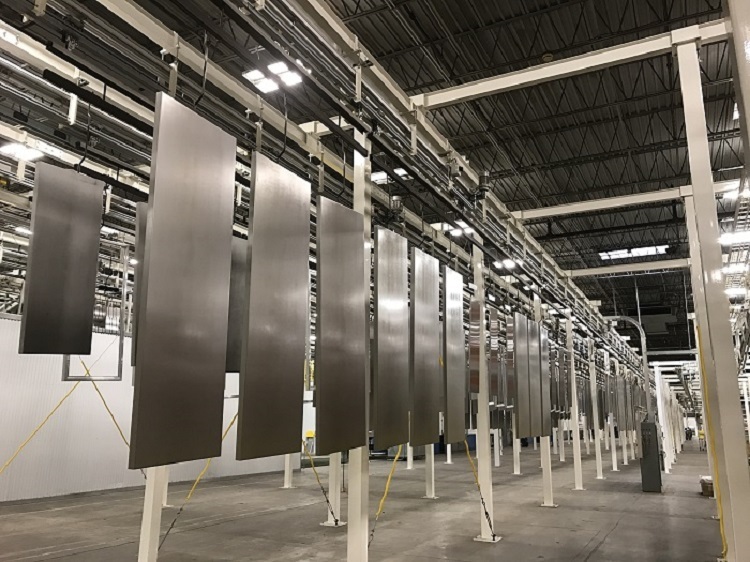 An IntelliTrak 500 Series Overhead Conveyor with 5 load stations (one robotic) and 4 unload stations with the capacity to store 160 full carriers and finishing capabilities to easily handle sheet metal panels up to 7 ft. long.